Hands down my favorite building in New York is Grand Central Station. 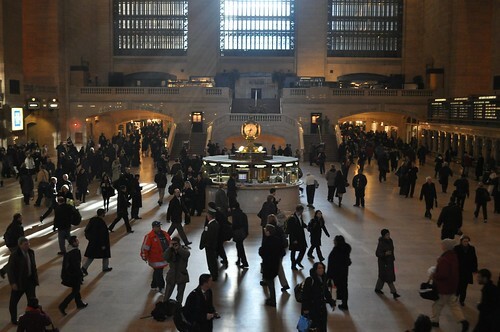 The last few years I worked in New York I lived in Connecticut and had to commute through Grand Central everyday. I know that seems crazy that I lived in another state and commuted back and forth but it’s actually a quick 45 minute express train ride. I honestly miss my train rides. I loved reading, knitting, and just having some quiet time to chill out after work. Last week, when I was in New York I commuted in with my sister. The morning light was gorgeous trickling down on the station floor. The green ceiling above was probably my first inspiration for my den. It’s gorgeous in so many different types of light. If I close my eyes I can hear the quiet rumble of voices and high heels bouncing off the stone walls. Couldn’t agree more. It’s stunning. Me too Jen. Hanson place has a similar look and feel. Wow I’ve never seen those photos. Gorgeous. Sadly, I’m always going through the dreaded Penn Station. Awful. great photos, Katy! 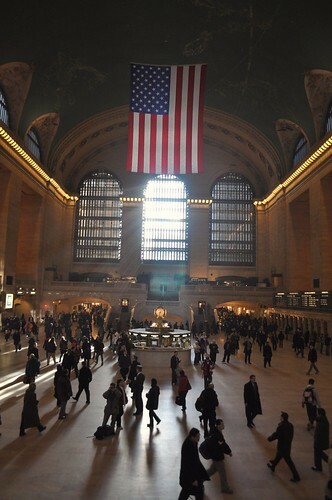 I always wish I could travel through Grand Central rather than Penn Station to see my family in NJ. 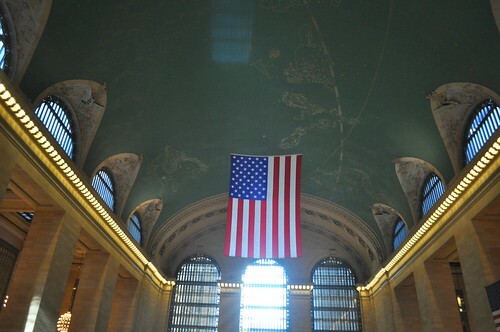 Grand Central always amazes me — that ceiling! And the food options are great. When I saw One Hanson Place for the first time for the Brooklyn Flea, it reminded me of Grand Central with its high impressive ceiling and old teller windows. The commute into NYC from NJ would be much more enjoyable if Penn Station looked like that! Hello Katy, I love your blog. I live in London but have friends in Swampscott so I know the area. Love the renovations your making to your home. My brother lives in NYC, and I’d have to say the Chrysler Building is my favourite. Katy, I love your site. We live in a fisherman’s cottage in Pargate, NW England which was built in 1790. I saw you found a shoe during the renovations- it was a common practice here from the 1400s-1900s to hide a shoe while building the house, often under the floorboards of the attic over a bedroom. Builders often find them (and usually replace them if they are superstitious) – it is thought that they were supposed to bring fertility and prosperity to the family, and protect against evil spirits. I heard of a couple recently who replaced the old shoe they found with a new child’s shoe, for someone else to find in a few hundred years. Keep up the wonderful, inspiring work! I admire your commute from CT for work. I actually commuted from Queens to Manhattan for High School! I guess that is par for the course in the tri-state area, especially when you hope to accomplish something extraordinary! Did you know the contellations on the ceiling are backwards? I used to commute in from CT, too. Much nicer than Penn Station. This is where I get off to go to work. I’ve been to the Oyster Bar many times. I love the atmosphere and the old counters. 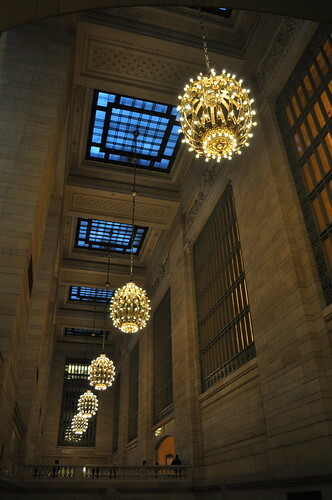 I love Grand Central! The shot of the hanging lights is great. Hopefully you got to have a quick bite at the Oyster Bar. My room is way too short to paint my ceiling green. I love the idea just not for my house. It’s a great green though. Here’s another great inspiration shot of a green ceiling paired with green walls. I’ve never been to NYC, but I feel like I am already in love with this station. That ceiling is incredible. Do you think that’s how you’ll do the green in your den, on the ceiling? I love the idea of painting ceilings a color other than white. Especially a bedroom, where you would wake up to it in the morning.